Our pillars are fitness, nutrition, chiropractic & mindset. To functionally train in a way that develops competencies in physical skills and enhance the three main metabolic pathways. To consume a diet that is rich in color and nutrients, from a wide variety of animals, fish, plants, fruits, fats, and starchy fibers. To be present in the moment, grateful for your life’s experiences, and embrace the transition into motherhood with an open heart. You've most likely heard of BIRTHFIT as a pregnancy and postpartum exercise plan. Which you wouldn't be incorrect about, because BIRTHFIT HQ does have fitness programming you can purchase on our website. However, the FITNESS pillar isn't just about exercising during pregnancy and postpartum. It's about training EFFECTIVELY in a way that will prepare you for your birth experience, adapting movements to keep you connected with your ENTIRE CORE (from your neck all the way down to your pelvic floor), learning proper breathing, core, and posterior chain engagement during movement (can help with common pregnancy and postpartum pains), and movement guidelines to support you during all four trimesters. If you're pregnant and newly postpartum and your trainer or coach has you doing any type of sit ups, crunches, twists, mountain climbers run for the hills!!! Our Prenatal Training and Postpartum Programs teach specific movements that are known to help reduce symptoms of diastasis recti, properly utilize the pelvis and pelvis floor, and build you and your posterior chain to be as strong as a mother! We are a network of Regional Directors, Coaches, Professionals, Doulas, Doctors, Nurses, Educators building a tribe to support women and families for a better future. We aren't just fitness! We talk all the talk including the importance of consuming nutrient dense foods, but also why you're craving simple carbs during pregnancy. Did you know that the spinal cord is the first thing built in-utero? That's why we think chiropractic care is so important, it houses the communication system in your body. During pregnancy your body, spine, and pelvis are trying to figure out how to support the new load and adjustments can help space for baby. MINDSET, what BIRTHFIT is really about! Keeping real with yourself, but also surrendering to the process of what it takes to build a baby (we know its not all magical flowers and rainbows) and giving moms the tools to tackle all of emotions and expectations that can sometimes come with it. We have been trained to have the tough conversations that come if there is an experience of pregnancy or infant loss, we can provide the space and resources to support you and your family. We support all women! Jaclyn Diaz is an educator, coach, and Regional Director of BIRTHFIT San Diego. 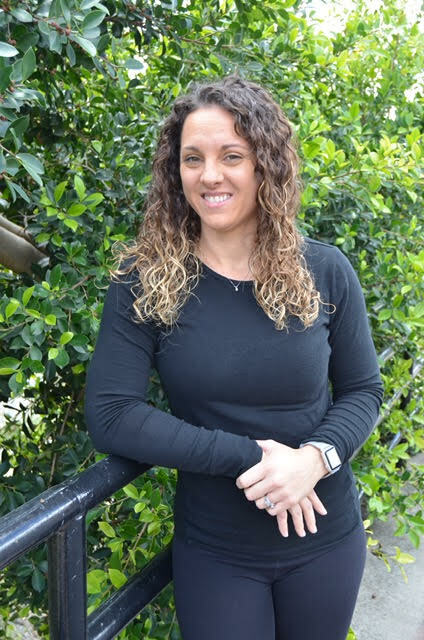 She has experience as a coach and instructor in the fitness and wellness world, and has also taught in formal classroom settings as a teacher. With a M.A. in Education she has spent years observing and adapting teaching and instruction to meet participants where they are at. My passion is to serve others to build healthy and strong family lifestyles. I love breaking down concepts (academic or physical) to its foundation in order to build the learning from the bottom up. Lindsy Nechak is originally from Ojai, CA and moved to San Diego in 2016 with her husband. She spent 6 years on active Duty for the US Army, has a Bachelors in Business Administration, is a CrossFit Level I Coach, BirthFit Coach, and an ISSA Personal Trainer. Lindsy has a great passion for helping others reach their goals and has made a career of coaching and training others. While pregnant with her daughter in 2018 Lindsy found BirthFit and is now helping train women in all stages of motherhood. I am a Mama, Birth Doula, Pre-and Perinatal Educator, & currently training to become a Craniosacral Therapist. But, really I’m someone who wants to offer support to other women and their children so they can cultivate a deeper connection and bond in whatever capacity I can. I also lead Conscious Conception Circles for women and couples, and Birth Healing Sessions for families. I truly believe that if we want to make a positive change for our future we must start with how we conceive, connect to and birth our children. Dr. Stan graduated from the Southern California University of Health Sciences, Los Angeles College of Chiropractic in 2010 and has since served the San Diego community with excellent chiropractic care. He specializes in the whole family: from preconception through birth, infants, childhood and beyond. Together, he and his team have built one of the top clinics in Southern California, Future Generations. We are looking to add BIRTHFIT Coaches to our team!